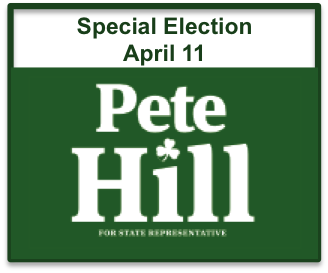 Following the tragic death of Representative Elaine O’Brien, the Secretary of the State declared there would be a special election on FRIDAY, APRIL 11th to fill the legislative vacancy in the 61st General Assembly District. Pete Hill was nominated unanimously at the convention to succeed Rep. O’Brien and represent the towns of SUFFIELD, EAST GRANBY and WINDSOR at the State Capital. He will work hard to honor her legacy . Pete Hill is running for State Representative to advocate for our towns and ensure our voice is heard in Hartford. He will focus on the issues that affect our quality of life—education, senior and veteran issues, keeping taxes in check, and moving Connecticut forward . Pete understands the challenges that families face every day in Suffield, Windsor and East Granby. 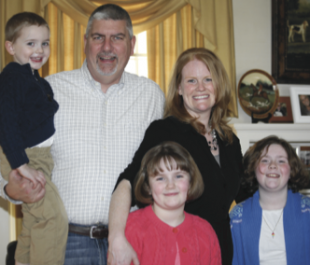 With three children (Norah 9, Sadie 7, & Cullen 4), Pete and his wife, Amy, know what it is like to juggle family, community involvement and successful careers. That is why Pete is running for State Representative. Hartford is missing our voice . With two kids in the school system and another about to start, Pete will make sure our schools are safe and that our teachers have what they need to give our kids the best education possible. As so much of health care shifts to Internet-based technologies, Pete understands that some seniors are being left behind. Pete will promote grants to provide more training at our senior centers. As an award-winning salesman, Pete spends nearly every day in our district talking with small business owners and understands the challenges that they face. Pete is running to continue the good work of Elaine O’Brien, such as fighting to obtain school security grants and improving the infrastructure within the Bradley Airport Development Zone.